Adding fresh herbs to your dishes always gives them that special something extra, but it's tough when herbs only stay fresh for a few days in the produce drawer. Herb Keeper to the rescue! It will prolong the life of your fresh herbs for up to three weeks in the refrigerator. 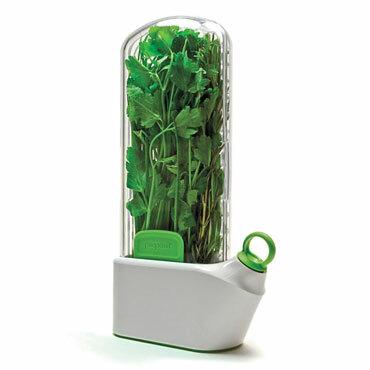 Its easy-to-fill water base keeps herb stems slightly submerged, allowing them to stay fresh and ready for any dish. Its removable stainless steel herb basket acts as a convenient strainer for washing, and its sleek design will fit seamlessly into your fridge. When you run out of herbs, try its upright design to keep asparagus fresh, too! Those long stems will stay vibrant, green and crisp for longer.